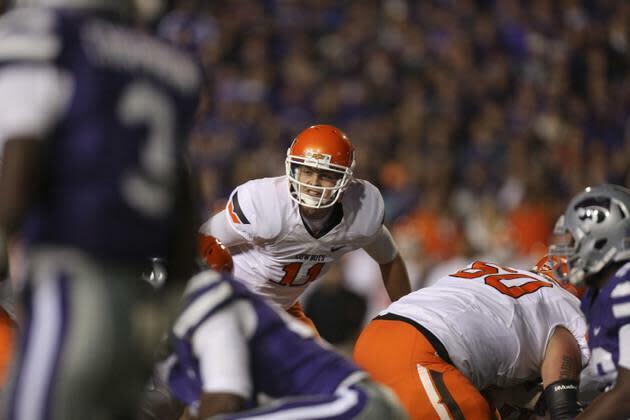 It turns out that Mike Gundy did lift some of the restrictions on Wes Lunt's transfer, but that shouldn't matter. This should be the case to bring about change, if the NCAA is not too busy screwing up the Miami case to notice that the "student-athletes" it says it protects are being held hostage by some vindictive coaches. Gundy put significant and unnecessary restrictions on Lunt's transfer from Oklahoma State. It was spiteful to a quarterback who wanted to move on (and did, picking Illinois) and go to a school where he thought he had a better chance to play. That happens. And Gundy should not be lauded for eventually lifting the restrictions, as reported by Channel1450.com (via PistolsFiringBlog.com). Lunt told Channel1450.com Gundy did so only about a week ago, well after they were put in place in mid-May, and by that time it was too late. By the time Gundy called Lunt's high school coach to let him know, Lunt said he had lost contact with the other coaches he had been previously restricted from. "It was frustrating," Lunt told Channel1450.com. "I understand the Big 12, that's obvious. The others, it was a little frustrating, but that's part of it and I understand it. It's all good." Lunt deserves credit for taking the high road, but it's a mistake to sweep this under the rug just because it seems everything worked out. Lunt grew up about 90 minutes from Champaign, and the fit seems good. Good for him. And maybe that's where he would have gone, restrictions or not. That should not be the point. This case has to show that the NCAA needs to stop siding with powerful coaches and actually help out the young players who generally have no other voice. Lunt said Vanderbilt and Alabama were two schools that showed interest, but he couldn't talk to. "Alabama would have been cool to check out, but I couldn't talk to them," Lunt told Channel1450.com. Lunt was a highly regarded recruit and looked good at times as a freshman before getting hurt. He could still have a NFL future. Transferring doesn't mean a player can't make it big in the NFL, ask Joe Flacco about that. And you can easily make an argument that going to Alabama would be better for Lunt's NFL future than going to Illinois, but he didn't have that chance. Or, maybe he would have gotten a better education at Vanderbilt. But he couldn't talk to those schools for a few weeks as Gundy flexed his power over a teenager. Gundy should have never, ever been allowed to put those sweeping restrictions place if the NCAA wasn't more worried about a coach avoiding the very small chance he'd have to play a transfer in a bowl game than a 19-year-old's future. It's going to happen again to another player, unless some rules are put in place to prevent coaches from having too much power in this situation. Maybe the next player won't be fortunate enough to have a school 90 minutes from his hometown to settle at. Coaches should not be allowed total control over restricting a player who wants to transfer. When they do, it shows the absolute worst side of college sports. But does the NCAA and its conferences even care? There are the petty interests of millionaire coaches to protect, after all.